It took almost three years and three designers to develope it, but now is here and it has a whole website on its own. 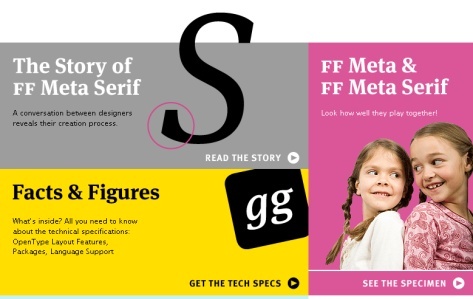 Front page of website immediately announce: “The most influential sans serif of the digital revoulution now has a serif companion: Introducing FF Meta Serif“. All through the 90’s designer Erik Spiekermann had tried to create a complementary face for his successful FF META. Many times happened that he was asked what could be the best serif match for it and he realized that he just had to create it. He finally asked collaboration to designers Christian Schwartz and Kris Sowersby. Development of the new font started both from the original META for the body (which, in its uniqueness, is heavier in the center stroke, while the two end strokes are lighter) and from Antiqua face to take inspiration for serifs. In website there is the whole thread of eMails exchanged between three designers during the period of creation to present the story of the font, which shows the great love they have for their profession and the great care for details they had all the time. We can buy both font in various combination of packages, and if we use FF META SERIF in our designs we can also submit our work to be featured (if selected) in the gallery and enter the competition to get a FONTBOOK. Sounds like fun. I will go and check it out. Fonts are so expresive a whole new art form. You have a great layout. However I’m still working at definitive layout, and this one is a free theme from blogohblog.com with some slight modification, if you like it you can download it from there.